When you publish a new book, finding the best seven Amazon KDP keywords can often prove a difficult task, especially for new authors. Even some seasoned self-publishing authors find this an onerous task. One of the most searched for phrases on our site is keywords, so it is clear that many authors are looking for help in understanding what relevant keywords do, how they work and how to find the most suitable seven for their books. To help in this regard, it is important to first understand the basics of keywords. Keywords are used by search engines such as Google, Bing and also Amazon, to understand what a website, web page, product, or in the case of authors, a book, is about. This is why keywords for your product, that is your book, are so important. Each of their search engines uses similar types of algorithms to quickly analyse a web page. During the analysis, which takes microseconds, an algorithm does not read the text as a human would. Instead, it looks for key phrases, repeated words, or words that occur in the title and main heading tags of a page. You may have heard of the term SEO (Search Engine Optimization). SEO is now a big business because good keyword optimization of a website or online store results in more web traffic and hence, more sales. The way to achieve this optimization is through the skill of selecting relevant search keywords or phrases, and including them in web pages and product descriptions. At the same time, keywords are highly competitive, as there are so many businesses and people trying to gain traffic from the same or similar keywords. If you think for a minute about all the companies online who are selling shoes, the keyword shoes is obviously highly fought for, as are sandals, trainers, Nike and slippers. Corporations and large businesses spend huge amounts of money on SEO because it is the best way to attract clicks to their websites, as well as online advertising, so keyword competition is fierce. To cut to the chase, the Internet runs on keywords, as does Amazon. This is why the selection of your seven Amazon KDP keywords is so vitally important. If you have a book on Amazon, you are an Amazon seller. So you want Amazon shoppers to find your book in search results. Amazon SEO is all about finding a specific keyword that will result in shoppers using search terms or search queries finding your Amazon product – your book. What’s long tail? Long tail keywords consist of more than one word, so in fact, they are short phrases. Many authors misunderstand this point when selecting Amazon KDP keywords, believing that a keyword should be only one word. This is not the case at all. Each one of your seven Amazon keywords should be more than one word. If you use one-word Kindle keywords in your selection, you will face extremely tough competition. As a result, your book will rank very low for them, if at all. Think here of seller central merchant words for shoe sellers. The keyword “shoe” would be worthless. However, real Amazon shoppers on the Kindle store rarely use one word when they type a search term, so the aim is to find short word sets that will attract people to your book. Using long tail, multi-word or semantic keywords is going to bring you much more success. While the search volume or the number of people who will use the phrase will be lower than for a one-word keyword, the keyword competition will be much lower. In this way, your book title will have a better chance of being discovered by Amazon customers in a product listing when they search for a new book. There are many free, as well as premium online SEO tools that can help you find appropriate long tail keywords and keyword suggestions. 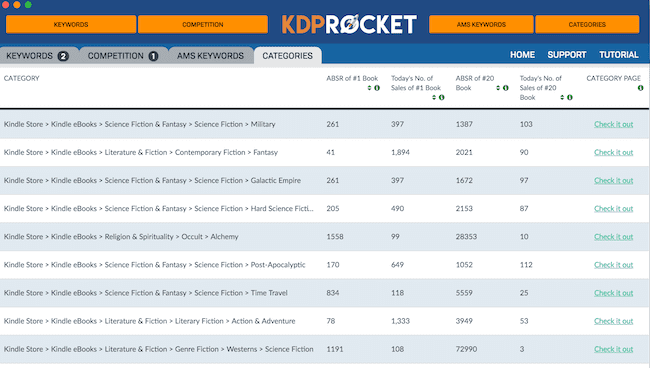 One of the best pro-tools for finding Kindle keywords and categories is KDP Rocket. It gives you real-time data showing you exactly what Amazon book buyers type into Amazon search, as well as how many monthly searches there are for these keywords. You can search for the best keywords, categories, check competitors and search for AMS keywords. 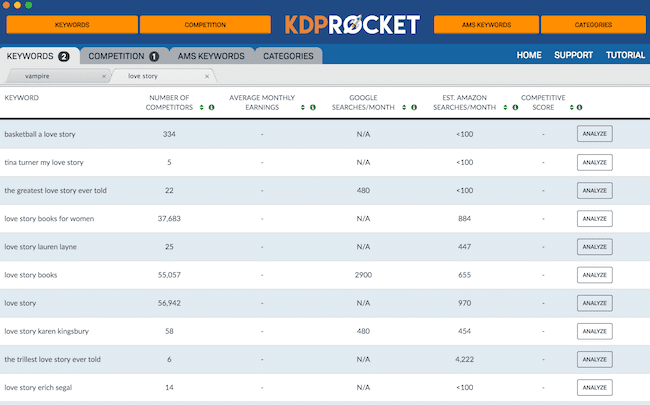 KDP Rocket is the fastest and most efficient way to do your Amazon keyword research. Finding the best seven Kindle keywords for your books and your two categories is vital for your success. As a bonus, you can also use the Amazon book description generator. Free tools can help you find usable Amazon KDP keywords. There are too many to tools list, but if you do a Google Search for free amazon keyword tool, you will find hundreds to choose from. The Google keyword planner, which is part of Google Ads, is also a good choice as is Google Trends. All of them work in a similar fashion to any keyword research tool. You type in a word or two and they will suggest a list of keyword phrases for you. You are probably already using one of the best free longtail keyword search tools and don’t even realise it. Google is a great tool to start looking for longtail keywords, because the suggestions given are real keyword terms that people have already used to search, and it’s such a simple process to find them. I will give you an example, and use as my starting one-word keyword, vampire, which would be a very bad choice as a KDP keyword because it is definitely highly competitive. Or in other words, it is already used by thousands upon thousands of other books and products. So, here’s my search for a better longtail keyword for my vampire title. When the search loaded, I immediately scrolled down to the bottom of the page to find this box with my first longtail suggestions that people have used when searching for vampires. Yes, Google gives you real longtail keyword suggestions. Too easy, huh? Great! Eight very good longtail suggestions. So then I clicked on vampire history and again scrolled to the bottom of the page. Yes, more new suggestions! Next, I clicked on vampire legends. I could keep repeating the process, finding new longtail keyword suggestions, but from three clicks that took only seconds, there are probably three or four potentially very good keywords in this quick search. I would probably pick, becoming a vampire, where do vampires live and do vampires exist to add to my research list. But remember that these are Google search keywords and not Amazon keywords. However, it does give you a guide to how people search for a topic. Similar to Google, you can find plenty of keyword ideas from Amazon Search that people have (really) used to find products on Amazon. Again, add your single keyword, and look for keyword phrase ideas. Let’s do vampires again. Once again you have a few more keyword ideas to save. Amazon doesn’t give you an extensive list, but by adding and to your search, you can find more alternatives. As you can see from the quick examples above, doing keyword research is not difficult. You can use free online keyword tools, such as Google, or you can also use the Amazon search bar, which I covered in depth in this article, How To Master Kindle Keywords. Whichever site, or combination of sites you use, add your newly discovered longtail keywords to a list, perhaps in Excel or Word. Then when you have say, thirty or forty, narrow down your list to the seven phrases that you think will best suit your book. However, don’t delete or discard the others you collected, because you might need to try them later. It doesn’t matter what genre your book is in. You can use the same process for romance, science fiction or paranormal by concentrating on finding potential KDP keywords that are related to your book’s theme. Once you have decided on your seven best longtail keywords and published your book, do not think that your keyword research is over. It is never over. To make the very best of your seven keywords, you should be checking each one regularly each month in Amazon Search to discover which ones work best for you, and which ones are doing nothing for your book’s discoverability. At first, you might be horrified to find out that none of your keywords are working well. But relax, this is normal and part of the trial and error process of finding just the right keywords for your title. When this happens, try more keywords from your existing list or find a few new keywords and try again. It might take you three or four attempts to get one truly high-ranking longtail keyword, so don’t give up. Keep your best keyword, but replace two or three under-performers, again, and keep hunting for more. SEO, keyword research and finding the best Amazon KDP keywords for your book will be work in progress for you for a while yet. But the effort it takes to research keywords will be worthwhile in the long term, as you will find perhaps four or five very strong, discoverable longtail keywords that will continue to attract potential book buyers to your book for years to come. For more information about KDP Rocket that was quickly covered in this article, you may like to watch this short introductory video. Great helpful hints. I’m currently using KDP Sponsored Ads for both of my books. One is doing great and getting sufficient clicks and sales. While the other – not so good. I’ll try your method on the second book and see if sales pick up. Thank you for sharing. Self publishing is a tricky landscape. Landmines. You are a good minesweeper. THANK YOU. Hi,my name is Xieyang Tao, I just published my book also now on amazon for sale,but I do not how to choose keywords. Do you recommend using the same keywords and categories for the Kindle and Paperback/Print version of the same book, or is it a completely new research process for each format? You can use different categories and keywords for an ebook and paperback. In fact, it can help discovery and search by extending your searchable metadata.